LiveHive is a cloud-based sales engagement platform that provides real-time intelligence based on customer engagement with digital content. Leveraging LiveHive’s cloud-based content-sharing platform and real-time analytics allows sales reps to better and more easily understand a prospect’s interest – as well as to quickly discover and identify everyone involved in the buying process. With LiveHive, sales reps can not only see when a prospect downloads a document but also how much time they spend on every single page — after the download! LiveHive not only instantly alerts sales reps when a prospect shares a document with others but also immediately sends profiles for recipients of all forwarded documents. 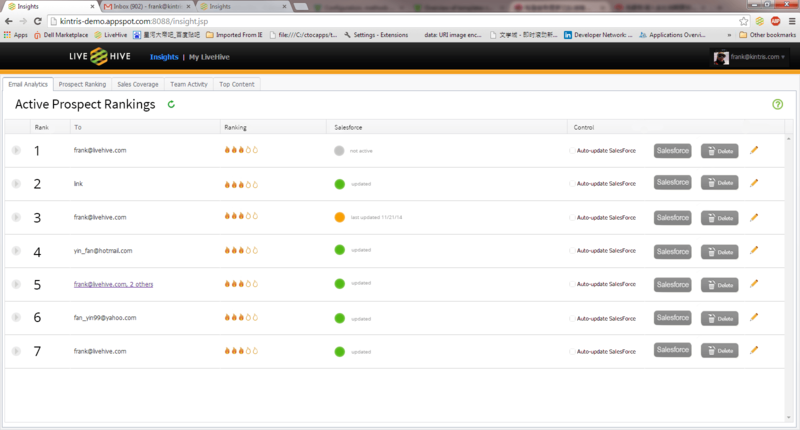 LiveHive also shows when and how many times a document or email is accessed. LiveHive lets sales reps capture all of the above insight on any digital content, including emails, MS Office, Google Docs, web pages, PowerPoint presentations, links, and images. LiveHive also provides all of its capabilities as part of a seamless mobile experience. Additionally, it is fully integrated with existing email and can be automatically synchronized with CRM systems. With LiveHive, sales professionals can quickly rank top prospects to save time, increase efficiency, and, most importantly, increase sales. Not sure if LiveHive is the best fit for your needs? Give one of our product experts a call today! Learn everything you need to know about LiveHive. Our experts will reach out to you shortly.